Virginia is a Commonwealth southern state bordering on the Atlantic Ocean and Chesapeake Bay. Major rivers include the James, the Potomac, the Rappahannock, the Roanoke, the Shenandoah, and the York. Although the Potomac forms the border between Virginia and Maryland, Virginia ceded its claim to the river to Maryland so its jurisdiction extends only to the low water mark on the Virginia side of the river. All of the state’s lakes are artificial except for Lake Drummond and Mountain Lake. With a coastline of 112 miles and a shoreline of 3,315 miles, about 7% of the state (3,170 square miles) is covered by water. What is Virginia’s maritime history? The Powhatan Indians lived in the Virginia Tidewater when the area was explored and colonized by Europeans in the 1500s and 1600s. Powhatan villages generally were located by rivers and the Chesapeake Bay, which they depended on for travel and fishing from canoes called quintans. Attempts by the Spanish to permanently colonize the area in 1570 proved unsuccessful but the English succeeded with the founding of Jamestown in 1607. Once tobacco growing took hold in the colony, plantations with docks were established along the rivers to transport crops to ships bound for England. Historically, the rivers and harbor of Hampton Roads, ice-free year round, have been of strategic importance for both commercial and military purposes. The Gosport Shipyard, one of the state’s earliest major shipyards built in 1767, now is home to the Norfolk Naval Shipyard. The Hampton Roads area saw military action beginning with the American Revolution and including the War of 1812 and the American Civil War. During the American Revolution, many British warships and other vessels were sunk during the Siege of Yorktown in 1781. Some ships were scuttled by General Cornwallis to obstruct an anticipated attack by a French fleet, led by Admiral de Grasse, aiding the Americans. Others were sunk during the ensuing battle with General Washington and French General Rochambeau or scuttled prior to Cornwallis surrendering. The remains of many ships lie in the York River including the transport Betsy, the HMS Charon, the Cornwallis Cave Wreck (probably the HMS Fowey), and the transport Shipwright. The Yorktown shipwrecks are listed on the National Register of Historic Places as part of an archeological district, and some of them have been studied by the Virginia Department of Historic Resources. During the American Civil War, the Union and Confederate navies each lost many ships at Hampton Roads. This includes the USS Merrimack and eight other Union ships that, along with the Gosport Shipyard, were destroyed by the Union Navy before the Confederates seized Norfolk in 1861. 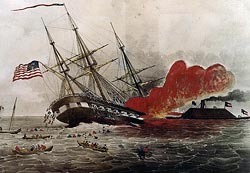 During the Battle of Hampton Roads in 1862, the CSS Virginia, built from remains of the USS Merrimack, sank the USS Cumberland, damaged the USS Congress that later exploded, and fought the USS Monitor in a standoff. Later in 1862, the Confederates destroyed the CSS Virginia during its retreat from Norfolk. 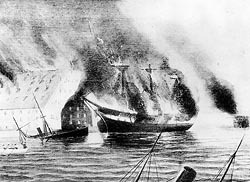 In 1864, the cruiser CSS Florida, taken by the Union Navy as a prize of war, collided with a troop ferry and sank at Newport News. The remains of some of these warships including the USS Cumberland and CSS Florida lie in the James River and have been determined eligible for the National Register of Historic Places. Many military vessels have been sunk as targets during military exercises in the Chesapeake Bay and the Southern Drill Grounds off the Virginia Capes. 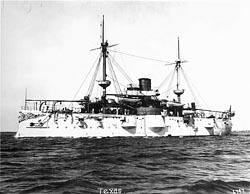 This includes German warships taken as prizes at the end of World War I, the cruiser Frankfurt, the battleship SMS Ostfriesland, and the torpedo boats S-132 and V-43, all sunk in 1921; and US battleships, the USS Texas, sunk in 1911, and the USS Washington, sunk in 1924. During World War II, many ships were sunk in Virginia waters in 1942 after being torpedoed by German submarines or hitting mines laid by the U-boats. This includes the SS Chilore, the SS David H Atwater, the Francis E Powell, the HMS Kingston Ceylonite, the Ocean Venture, the Santore, and the SS Tiger. In 1943, the Liberty ship SS John Morgan sank off Cape Henry after colliding with the SS Montana. In the 1970s, six World War II Liberty ships were sunk by the Virginia Marine Resources Commission as artificial reefs to form the Triangle Reef off Virginia Beach and the Parramore Reef off Wachapreague. This includes the SS Daniel Webster, the SS Edgar E Clark, the SS George P Garrison, the SS James E Haviland, the SS John Page, and the USS Mona Island. Who takes care of Virginia's underwater archeological sites? All state agencies have the responsibility to preserve and protect underwater archeological sites and other historic property on state-owned submerged land for the public benefit. The Virginia Department of Historic Resources, whose Director serves as the State Historic Preservation Officer, determines which sites have historic value and is consulted, along with the Virginia Institute of Marine Science and other concerned agencies, by the Virginia Marine Resources Commission prior to issuance of permits for study of underwater sites. You must apply for and obtain a permit from the Marine Resources Commission before exploring or recovering any underwater historic property including shipwrecks and submerged terrestrial sites. A permit is granted when the Marine Resources Commission, with the concurrence of the Department of Historic Resources and in consultation with the Institute of Marine Science and other concerned state agencies, finds that it is in the best interest of the Commonwealth. Once a permit is issued, the recovery operations must be carried out under the general supervision of the Department of Historic Resources and in such a manner that the maximum amount of historical, scientific, archeological and educational information may be recovered and preserved. Objects recovered are the property of the Commonwealth and title is retained by the Commonwealth unless objects are released to the applicant by the Department of Historic Resources. Applicants may be provided with a fair share of the objects recovered or, in the discretion of the Department of Historic Resources, a reasonable percentage of the cash value of the objects recovered. What laws concern underwater archeology in Virginia? Laws of the Commonwealth of Virginia are in the Code of Virginia. Laws about historic resources including underwater sites are at §10.1-2200, et seq., and laws about submerged land are at §28.2-1200, et seq.